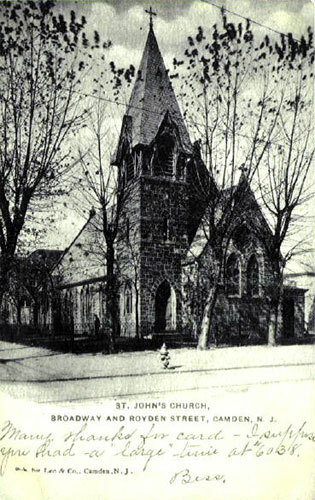 St. John's Parish was incorporated January 7, 1852, having been in its inception a mission of St. Paul's Parish, under the Rev. Lybrand. 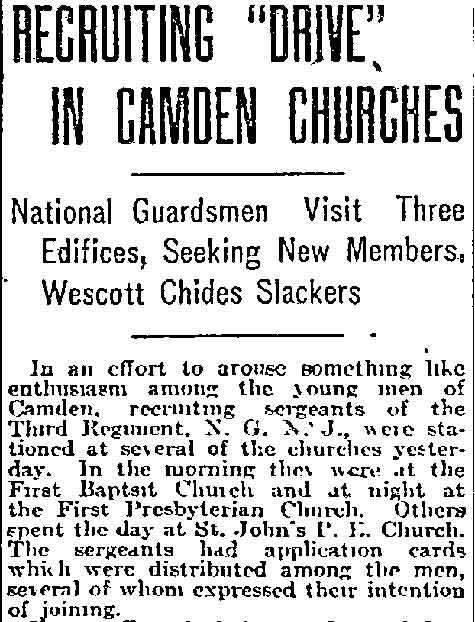 He makes this first mention of it in May, 1847: "Three young men of the congregation have devoted themselves and their means to the service of the church, and expect soon to become candidates for Holy Orders. With their valuable cooperation and with means supplied by a few friends in Philadelphia, I have been able to rent, in the lower part of the city, three-fourths of a mile from the church, a school house, which will be used as a chapel for the benefit of a much-neglected, yet interesting and respectable, portion of our community. A flour­ishing Sunday school is already in operation, and as soon as the arrangements are completed, I shall, after the two usual services at the church, hold there a third service at night. So rapidly is our population increasing, and so cheering are the prospects of the church, that I trust this little chapel will prove the beginning of what, after a few years of fostering care will become a second parish." The work was carried on regularly for two years, after which the absence of the candidates for Holy Orders and the feeble health of the rector compelled an interruption. In the fall of 1851, Mr. Elvin K. Smith having taken Deacon's Orders, returned to the work, and organized the parish, remaining with it until August, 1858. Beginning in November, 1851, services and Sunday school were held in a hall at Fourth Street and Spruce. 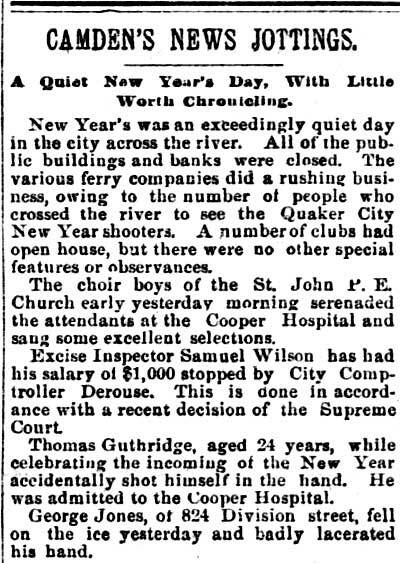 In January, 1853, ground was purchased at Broadway and Royden Street, and in March the "Floating Chapel of the Redeemer, for seamen of the port of Philadelphia," was bought, removed from its base (two canal-boats braced together), and drawn across the open lots to this site. 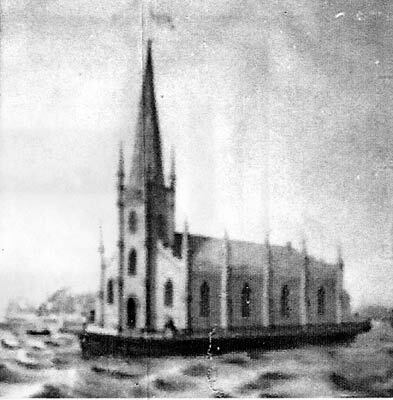 The Floating Chapel, which was the original building that housed St. John’s Episcopal Church, was originally constructed to serve the needs of sailors at the port of Philadelphia. In 1847 a group of Philadelphia civic leaders headed by attorney James Booth founded the Episcopal Churchmen’s Mission Association under the support of the Episcopal Diocese of Pennsylvania. The new mission needed a chapel. A $50 prize was offered for the best plan submitted. Clement L. Dennington won with his suggestion of a floating chapel that could accommodate 500. Dennington, a New York architect, was inspired by the two floating chapels operated by the Seamen’s Institute in that city. In the spring of 1848 Dennington began work. The hulls of two clipper ships, each weighing 80 tons were lashed together. On top of this a platform 37 x 85 feet was constructed. The chapel, built of wood in the standard Gothic style, complete with pipe organ and a bell, was completed in seven months at a cost of $5270. Its steeple towered 75 feet. On a snowy December day in 1848, the Right Reverend Alonzo Potter, Episcopal Bishop of Pennsylvania, consecrated the chapel, Church of the Holy Redeemer. It was moored at the Dock Street wharf until 1851 when the pier was leased to a pier at Spruce Street in Philadelphia the following year. The Holy Redeemer became a familiar site in Philadelphia’s harbor. As its popularity grew so did the demands upon it. The sailors wanted overnight lodgings, recreational facilities, and most of all an established address. With this in mind and the costly upkeep of the chapel, which nearly sank in a storm the year before, the Churchmen’s mission abandoned the chapel and built a new mission on land. In 1853 the floating chapel was offered for sale. 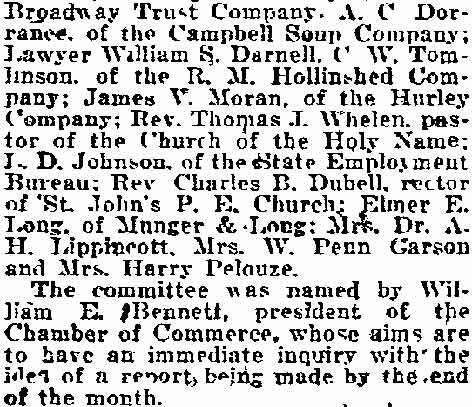 The newly formed St. John’s Episcopal Parish purchased the chapel and towed it to Camden where it was placed on a brick foundation at Broadway and Royden Street. The removed church, newly named St. John's, was re-occupied on the sixteenth Sunday after Trinity, September 11, 1853. The zeal of the parish soon began to reach beyond its own borders.. In October, 1854, the pastor established a weekly cottage lecture in the village of Stockton, one mile south of the church, and this soon developed into a Sunday afternoon service, with Sunday school. Here was the first breaking of ground for the Church of Our Saviour. The present (as of 1886) rector, Rev. John Hardenbrook Townsend, entered upon his duties October 18, 1881. The Church was destroyed by fire on Christmas morning 1870. Prowell wrote: "Just cleared of debt and renovated, the dearly-loved building, thrice consecrated by formal act, by a quarter-century of holy rites, by the toils and tears for its redemption, the holy house accidentally took fire on the morning of Christmas day, 1870, and in a short hour was a heap of smoking ruins. Did it seem a whole burnt offering unto the Lord, devoting anew the hearts of His people to fresh efforts for their Zion? So we may read the prompt resolution of the rector, wardens and vestry to replace the old frame building by a beautiful stone Gothic structure. 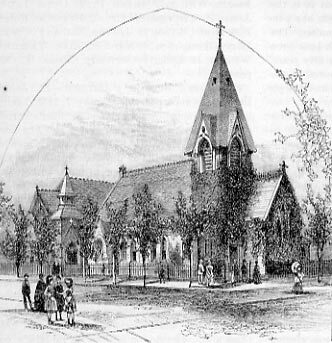 The cornerstone was laid on April 21st, and the building opened for worship December 3, 1871. During the winter of 1884-85 the parish building was built, and the interior decorated. 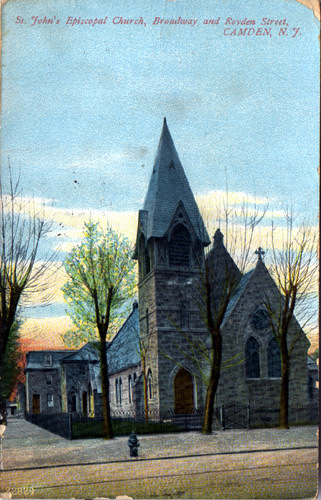 On St. George's day, April 23, 1885, the church was consecrated and the parish. building formally opened by the bishop of the diocese. The erection and enlargement of the parish building has been naturally accompanied by the formation of the parish guild, with its various auxiliary societies, and by the organization of St. John's Workingmen's Club and Institute. Branch Sunday schools have been established at several points within the parish limits for the accommodation of the increasing membership." Reverend Gilbert R. Underhill, rector of St. John’s Episcopal Church for fifteen years, left early in the year for a mission in the Philippine Islands. 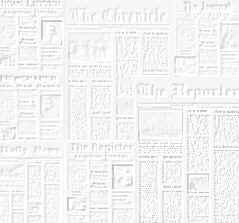 A card party will be held in the parish house of St. John's Episcopal Church, Broadway and Royden Street, Friday evening, for the benefit of the church. 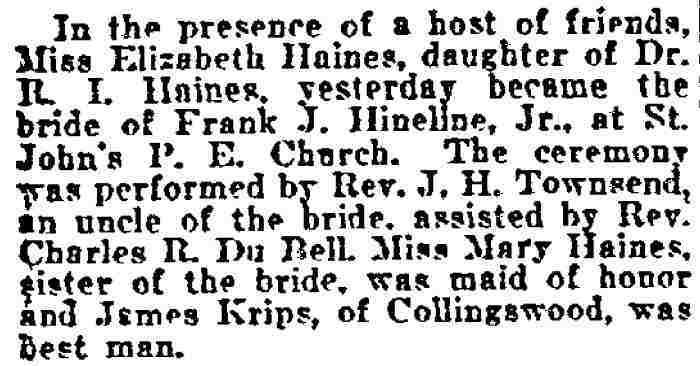 Mrs. Annie Kleinheinz is chairman of the committee on arrangements and is being assisted by Mrs. Mary E. Dorman.. The Rev. Norman S. Howell will be formally instituted as rector of St. :John's Episcopal Church, Broadway and Royden street, Camden, tonight. The service, which will include the full Prayer Book office of institution, will begin at 7:45 PM. The Rt. Rev. Ralph E. Urban, suffragan bishop of the New Jersey Diocese, will act as institutor and will preside at the ceremonies. Clergy of the vicinity, including the rector's father, the Rev. John Alleyn Howell, of St. Michael and All Angels Church, West Philadelphia, are expected to be present and take part in the procession. The office of institution provides for the turning over of the parish keys to Father Howell by the senior warden of the parish, Harry Baumgartner. Levi Stratton, junior warden, will also have a place in the service. A Prayer Book, Bible and copies of the canons of the diocese, the general church as well as the parish by-laws, will be formally given to Father Howell by Bishop Urban. Father Howell came to Camden last summer, accepting a call to St. John's in August. Previous to that he had been engaged in supply work hereabouts after resigning the rectorship of St. Saviour's Church, Akita, Japan. St. John's had been previously in charge of Rev. 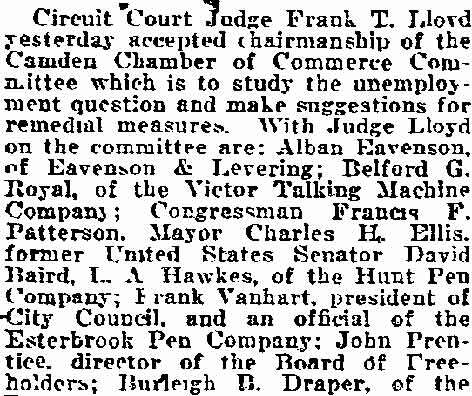 William Sidener, of Steubenville, O.
Sir-In the Question Box, entitled "Did You Know?" of Friday, June 2, 1933, the question is asked, "Who founded the Church of England?" and the answer is given, "Henry VIII." This is absolutely incorrect! The Church of England was in ex­istence 1300 years before dear old King Hal with his many wives was born! Christianity came to England sometime before 20 A. D., just when we do not know nor who first planted the Catholic church there. There were British bishops at the Council of Arles in 314. St. Patrick himself was the son of a British deacon, dying in 463. St. Augustine came to England in 597, sent by the then bishop of Rome, Gregory. Unfortunately, this whole question is bound up with the claim of the bishop of Rome to be head of the Catholic church. Not only do we say he is not, but it can be proved that even the earlier bishops of Rome repudiated such a claim. There are today 250 millions or Catholics who never have recognized the pope as more than patriarch of the western church- the Orthodox Catholic churches of the Near East. And these churches are older than the Roman Catholic Church which rests its position upon the primacy of Peter among the Apostles (an agreed fact) and that he (St. Peter) was accorded the power to transmit the bishops of Rome this primacy (a fallacy). It is by no means cer­tain that St. Peter ever was in Rome- the tradition is late, but there is no good reason to doubt it. Were the pope the head of the Catholic Church, as he claims, the repudiation of his temporal authority by Henry the VIII would have been schism. As a matter of fact, Henry VIII never denounced the pope's spiritual authority; only his temporal. I am told he died a loyal son of the Roman church. Actually, the Roman church with­drew from England, but there the same Ecclesia Anglicanna went on; the Church of England and her various daughter-churches throughout the world have ever been Catholic, ever true to the Catholic church, but denying that the pope is head of the Catholic church. With the exception of the infallibility of the bishop of Rome and the belief in the immaculate conception of the Blessed Virgin Mary (this last unscriptural but very likely quite true) the doctrine of the Church of England and the Episcopal Church IS the same as that of the Roman Catholic Church. Nor is this be­cause we are imitating them but because we are spiritual cousins. Many have been puzzled at our very cumbersome legal title of Protestant Episcopal Church. We do not like it, for it is misunderstood. The "Protestant" really means "protestant," but is not the same as the "Protestant" of the Protestant churches. The meaning in full would be something like this: "An Episco­pal (Catholic) church which protests against the claims of the bishop of Rome to be the head of the Catholic church." I was ordained a priest in the Japanese Holy Catholic Church (Tokyo, 1927) and the Roman Catholic Church has done us the great honor to incorporate (not legally, I think) the character (ko) which means "Catholic" into the name of their Japanese church. I hope, therefore. you will please publish this letter, not because I enjoy entering into controversy with anyone, let alone the great Roman Catholic Church, for which I hold the greatest respect and admiration, but rather that your readers may know that the Church of England was not founded by Henry the VIII, but is a Catholic church with a history of 1700 years, only 500 of which were under the aegis of the Roman church. (a) They uphold and propagate the Catholic and apostolic faith and order as-set forth in the Book of Common Prayer. (b) They are particular or na­tional churches, and as such promote within their territories a na­tional expression of Christian faith, life and worship. (c) They are bound together not by a central legislative and executive authority, but by mutual loyalty sustained through the common consent of the bishops in conference. Please pardon my using so much of your space, but the question is a very important one and the answer given by your editor incorrect. Rector, St. John's P. E. Church . 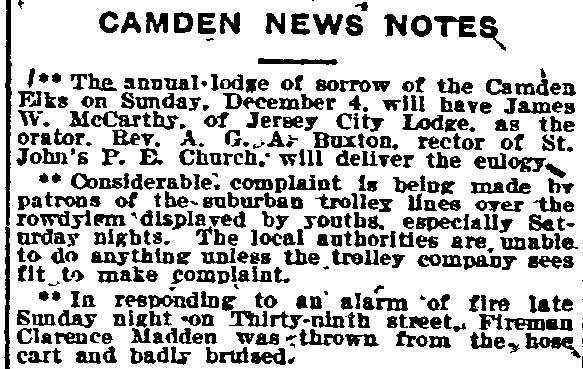 Kidnapping of a former Camden clergyman's wife in Philadelphia was solved yesterday when 30 witnesses identified a man and two boys in connection with miscellaneous automobile thefts. The three admitted 24 holdups and to stealing more than 20 cars. 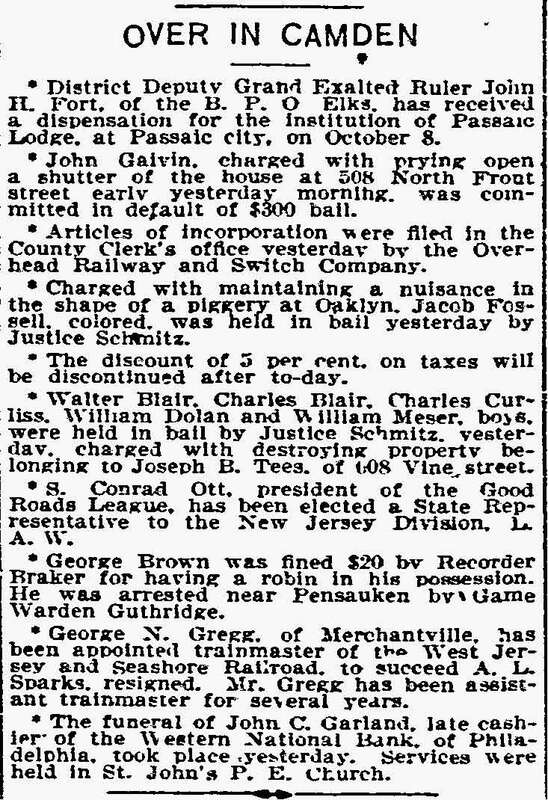 They were identified as the three who stole the machine in which were seated Mrs. Anna DuBell, whose husband, Rev. Charles DuBell, is rector of St. Simeon's Church, Philadelphia. He formerly was rector of St. John's Church, Camden. The thieves, later threw Mrs. DuBell out of the car. 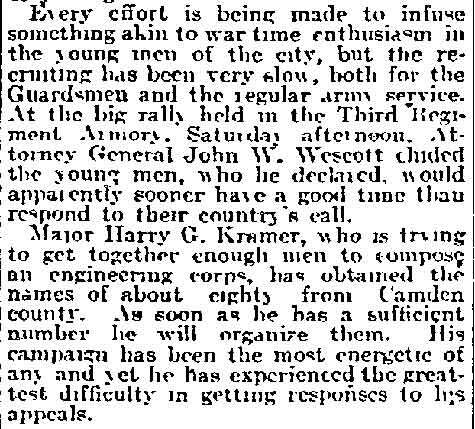 The prisoners are Eugene Bishop, 27, Fifteenth street near Girard avenue; Lester George, 17, and Elmer Camp, 17, both of Thirteenth street, near Diamond. They were held without ball on 24 separate charges. Sir- As a lifelong Episcopalian, may I comment on the recent letter of the Rev. Norman S. Howell concerning the founding of the Church of England. His letter is a typical piece of theological hair-splitting. His argument, in brief, is that since the Church of England, before Henry's time, was in existence as part of the Roman Catholic Church, therefore it was in existence as the Church of England. On that line of reasoning one may go back and claim that the Episcopal Church, and the Roman Catholic Church as well, have been in existence since the dawn of history- as each unquestionably has the foundation of Jewish theology as expounded in the Old Testament. spiritual authority, then it is only reasonable to say that the date of the schism is the date of the founding of the new church. High Episcopal churches, to be sure, embrace much of the Roman Catholic ceremony; but low church Episcopalians do not. demonstrable fact is that the Church of England was not in existence in 1533- and was in existence in 1534, when Henry defied the pope. To say that the Church of England was "inside" the Roman Catholic Church prior to the break is to bandy words. All my life I have heard this argument brought up, and as one born and raised in the Episcopal Church it irritates me about as much as the old German pastime of trying to prove that all great men were of German birth. Church" with that great and noble church ruled over by the pope of Rome. Christians who are not under the supervision of the pope of Rome. The story that Henry VIII founded the Church of England is a fable; in fact, that it was founded at the time of the Continental Reformation is a misreading of church history. The truth is that it was started before 200 A.D. in England by unknown missionaries, was incorporated into the papal system from 1066 until 1534 when Henry VIII and Parliament declared that "the bishop of Rome hath not by Scripture any greater authority in England than any other foreign bishop." The Church of England today is the Catholic Church in England just as she was through the centuries since 200 A. D. I, or any other priest of the Episcopal Church, welcome the chance to correct error- especially when our origin is called into question- but we do not delight in, vain arguments. If "Windsor" or any other person desires to know the truth we will be most happy to help them out. Corp. Raymond C. Thoirs Post No. 47, Camden- The post's chaplain, Rev. Norman S. Howell, sponsors the Good Samaritan Industries, conducting a workshop at Front and Pearl streets, where persons otherwise unemployed may work at repairing clothes, furniture or most anything given them. The profit de rived from these reconstructed articles goes to pay them for their efforts. 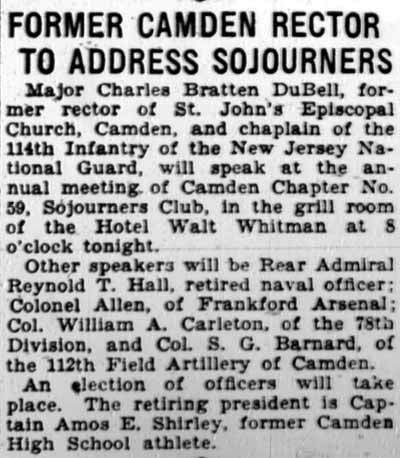 Commander Hamilton suggests that you clean out that attic and give Chaplain Howell a call at St. John's rectory, Broadway and Royden Street, Camden, and he will have someone call to get the articles.